There are several causes for downed poles during this event. 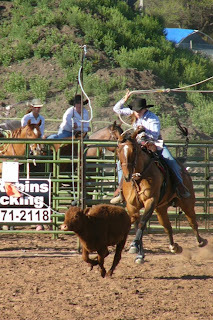 1) Pole bending requires a level of precision unmatched by any other timed rodeo event. Many riders underestimate the skill required at high speeds and invariably knock the poles down. 2) Horses often stiffen when rounding poles. A horse that flexes at the wrong time can position the rider too close to the pole, causing the rider to down the pole with her knee. 3) Direction changes require perfect timing. 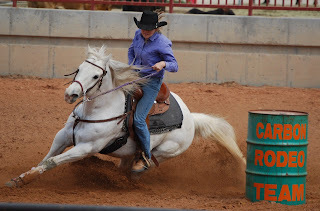 If a horse changes direction a second too soon, the rider's knee will often down a pole. 4) A horse that flexes in the wrong direction can cause downed poles. Ideally, a horse should flex in an arc that surrounds the pole. When the horse is inversely flexed, its flank can push the rider's knee into the pole. In Pole Bending, it is important to bend your horse. 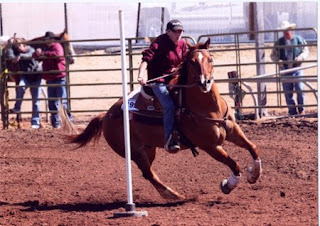 Getting the horse to flex around the pole creates more clean pole runs. 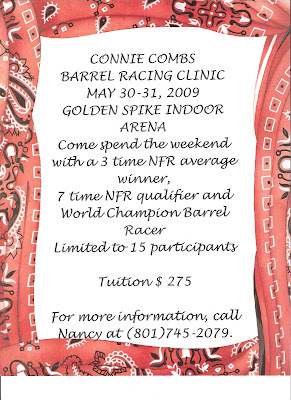 When you practice most kids want to go fast to make sure that they can perform well at a rodeo. That is totally the wrong thing to do. We have come to the conclusion that if you practice slow and carefully you will perform better at the rodeos. 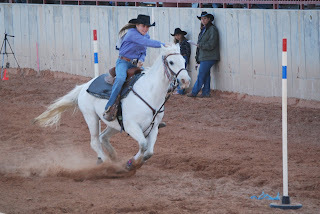 When you practice slow and do it perfectly every time you build muscle memory and when you have to do it faster at the rodeo your "muscles will remember what you have practiced and do it quickly." I know it sounds really dumb but it works. If it is goat tying, do it slowly. If you run barrels or poles, walk through the pattern and get in the correct positon as you enter the barrel/pole turn. 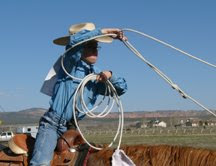 If you rope, make sure that your elbow, wrists and hands are in the correct positions . PRACTICE PERFECT and the results will show. Look at her get her horn and turn that barrel! Too cute! I find that this often happens in barrels and poles. The girls hits a barrel or pole or thinks that she has hit one and looks back to see if it is still up. While she is looking back, she is either missing riding to the pocket of her next barrel or she is hitting the next pole. Always, tell your kids to keep their heads up and focus on where they are going. If they did knock over the barrel or pole, there is nothing they can do about it anyway.